Mayonaka wa Junketsu 2, song is a must have. -The actual PV is pretty cool, very Konya Wa Kasaragi but probably better executed overall. -Hoping the 'gunshot' sounds are just on the PV (most likely the case). So yeah... top track, pity it's so damn short. So happy. SO SO HAPPY. so it's more SAPS feat. Shiina Ringo. Damn, and "Spy High" sounded like such a good song for Ringo to do... Oh well, the strength of the actual single alone is enough for me to buy it. (The other songs won't be awful either I don't think, is one of them the song used in the original preview clip? Cause that sounded awesome). 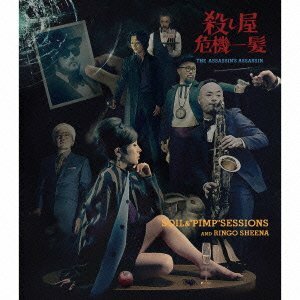 You could think of Shiina Ringo as SAPS's muse for the project, as the whole thing is spy-themed. 'Pimp Panther' made me smile.